There is no better way to describe the weather at this Badger homecoming game. A chilly spring like rain fell just before kickoff, which led to dry, cool, gray autumnal skies. An unexpected torrent of wintry snow then whipped wildly around Camp Randall, which gave way to a sunny summery sky. Actually, that was just the first half, and it unleashed havoc on both offenses. Illinois struggled most miserably as Wisconsin forced five turnovers in four seasons. Somewhere amid the cornfields of the midwest lies Champaign, Illinois. It’s a great college town with mounds of enthusiasm and passion for their team. On gameday, tailgating takes place in open fields where music blasts, games are played, and footballs are tossed. You might even catch the band performing a quick drumline or “Oskee Wow Wow” before they make their march into Memorial Stadium. Right before kickoff, as though it were a rally cry, one hopeful Scarlet Knight fan hollered, “There is only one team worse in the Big Ten than Rutgers – Illinois!” Well, the game would prove that even that was not true. In a stadium where a sign held up by one student mockingly reads, “1869 National Champs,” many fans have been feeling the sting of joining the Big Ten. Daaaaaaaaaaa Illini. That sure doesn’t have the same ring to it, but with tonight’s game taking place at Soldier Field – it’s quite fitting. Add Ditka administering the pregame coin toss, and it’s practically a scene on SNL. This game really wasn’t supposed to be a threat for the incoming Huskies. But, a surprising 2-0 start had Illinois fans imagining the possibilities. A strong contingent from Seattle filled the south loop bars while Illinois fans combated with their ILL-INI chant. Another typical Illinois football afternoon was shaping up in Champaign. The tailgating didn’t miss a beat despite frigid temperatures. 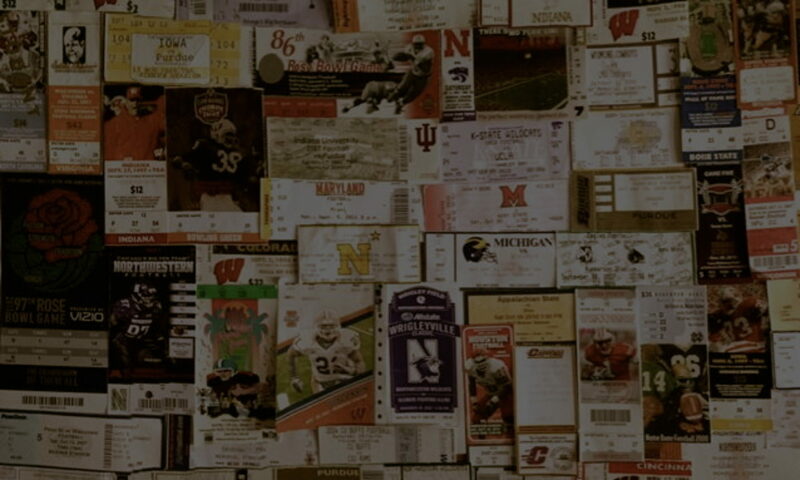 It’s never too cold for Big Ten football. 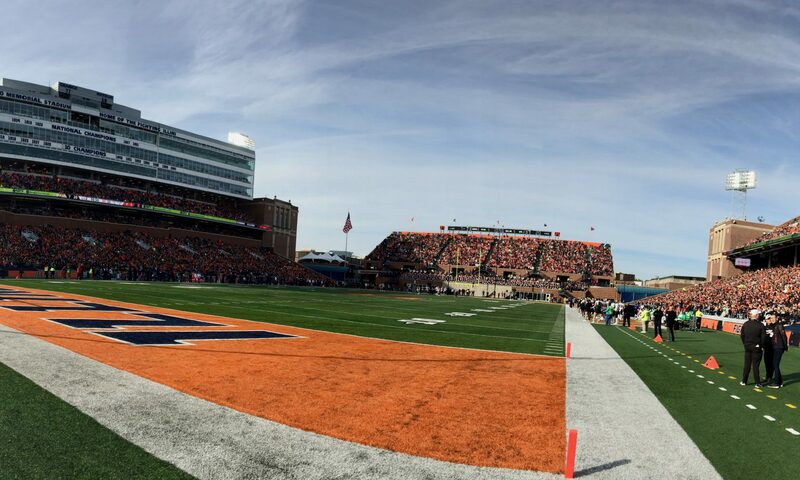 The Illinois band boomed “Oskee Wow Wow,” and fans appeared geared for a big game. A casual observer might not be able to detect that Illinois is battling a four game losing streak that has caused the media to grumble and put Coach Zook on the hot seat. Perhaps it wouldn’t leave such a bad taste in the mouth had they not ignited hope with a six game win streak. “Hoosier Football” are two words that go together about as well as “Lite Syrup” or “Economic Stability.” Combine one bowl in 17 years and six different head coaches in the same time span. Add to it a 45 year Big Ten title drought and you have the Indiana football program. Memorial Stadium in Bloomington has been recently expanded, which just means more empty seats. We got to the stadium early and stood in the expanded horseshoe area attempting to catch a few pregame practice kicks that lofted high enough to land in the stands. As soon as the announcement was made that College Gameday would be live from Wrigley Field, my mind began to create signs for this historic matchup. The best I could come up with was “Go ‘Cats!” with the “C” being the Cubs logo. The magnitude of my sign’s creativity decreased once gameday arrived. We hopped the Clark Street bus at around 6:30am and began to venture toward Addison. The bus stopped at the corner and the College Gameday stage and bus appeared at the right, while the classic “Wrigley Field” sign came into view at the left. Only this time, its red hue had been replaced with purple. On this late November day, the curtains closed on a very historic college football trophy. Northwestern and Illinois have played for the Sweet Sioux Tomahawk trophy for over six decades. However, the Illini had recently been stripped of their mascot due to its perceived disrespectful nature to the surrounding tribal nations. Anything bearing any reference to Indian culture had to be removed from the campus or they would suffer probation. Included in this cleaning process included the Sweet Sioux Tomahawk trophy. This would be the last game where the trophy would be awarded and even if Illinois won, they were not allowed to keep it. October is not supposed to be this hot in the Midwest. The Illini aren’t really supposed to be that hot either, but with head coach Ron Zook at the controls, no 90 degree weather is going to keep their goals out of reach. Fifth ranked Wisconsin came in as an underdog to the unranked Illini and few people viewed this as surprising. The Badgers have been winning by a thread each week displaying a defense that had a tendency to spring leaks. The expansion and construction of Memorial Stadium served as a nice metaphor for the entire program as it is moving toward a bigger and better future. Today would be the major turning point.